Today is Chalk-a-bration, a celebration of poetry in chalk rounded up each last-day-of-the-month by Chalk-a-bration founder, teacher and blogger Betsy Hubbard. 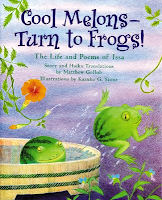 Stop by Betsy's blog, Teaching Young Writers, to visit other chalk poems and hey - why not chalk your own and share with us! Students -Today's poem is about exactly what our family is doing at exactly this moment in time. Picking pears. And apples. This fall's harvest at The Poem Farm is glorious, and we are gathering all we can from branches and ground. 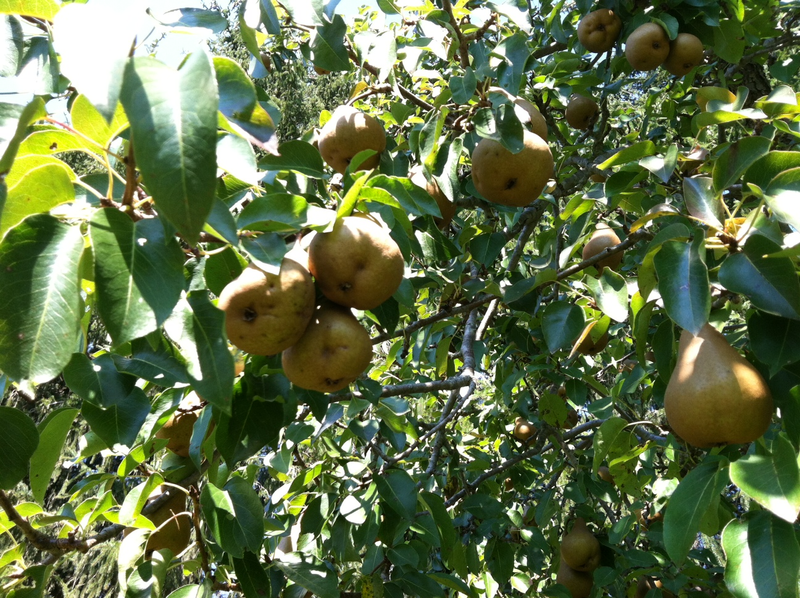 Yesterday we filled four bags of pears, and today I will chop some up and dry them in our dehydrator for snacks through winter. You will see that today's poem is short, does not rhyme, and simply stops a moment in a season. It is a haiku, I suppose, though it does not beat out the 5/7/5 syllables we may first consider when thinking about haiku. 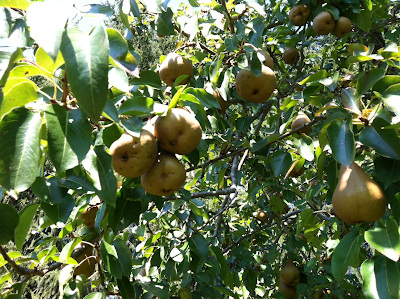 Yesterday, as I watched our children climb this tree and shake the branches, I thought, "It is raining pears!" I will try to post a video of today's shaking as it is quite amazing to watch so many pears fall at once. One must get out of the way! Watching seasons carefully for signs and beauties and surprises is a wonderful way to sneak up on a poem idea. Try it. Look outside. Walk in a natural place. What is changing? What strikes you? Try writing a few short lines of your observation. Let it be short. Include only what matters. 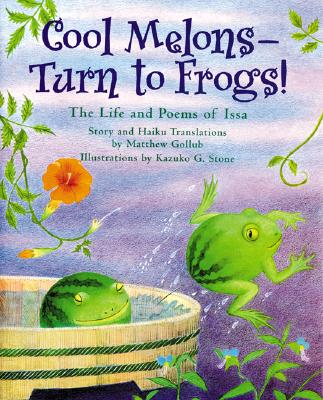 If you would like to read more about haiku and Issa, a well-loved haiku writer, this book with story and translations by Matthew Bollub and illustrations by Kazuko G. Stone, is a great place to go. Happy Chalk-a-bration! Thank you, Betsy! This is a first for chalk-a-bration. A poem in a tree is marvelous. I smiled so big when I saw this earlier this morning on my phone I think everyone around me was puzzled! Love it so much. Thanks for being such a great supporter and I am so glad you joined in today. I can't help but sing to myself after seeing your chalk poem today. 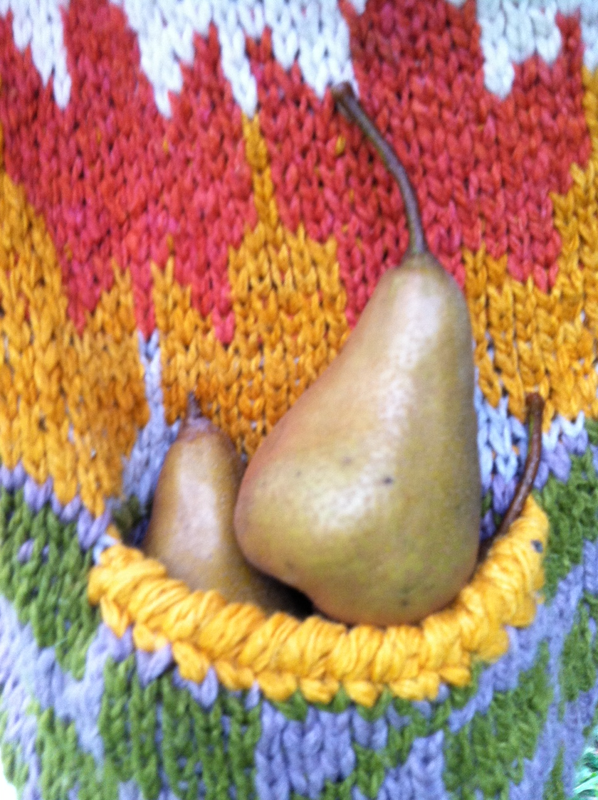 Think of the 12 Days of Xmas song - "...and a poem in a pear tree." Love it! Great photos! 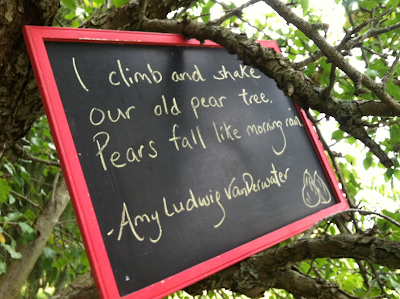 Getting a shot of the chalkboard poem in a tree is special. Wow, you are lucky to have such a harvest! What will you do with it? Pear jam, pear butter, pear leather?